Hey Teacher friends… I am running a special educator discount! When you sign up with a Young Living premium starter kit, I will give you the reference app, 2 rollerballs, 2 sample bottles, AND my DIY thieves spray! I will also help you get started with using the oils and you will also get access to several Facebook groups for continued support! Let me know if you are interested or your can check out the essential oils tabs for more details! 2 Responses to Special PSK Educator Discount! My name is Tania Gallegos, and I just signed up for YL under you. My friend Theresa Thompson “introduced” me to you. 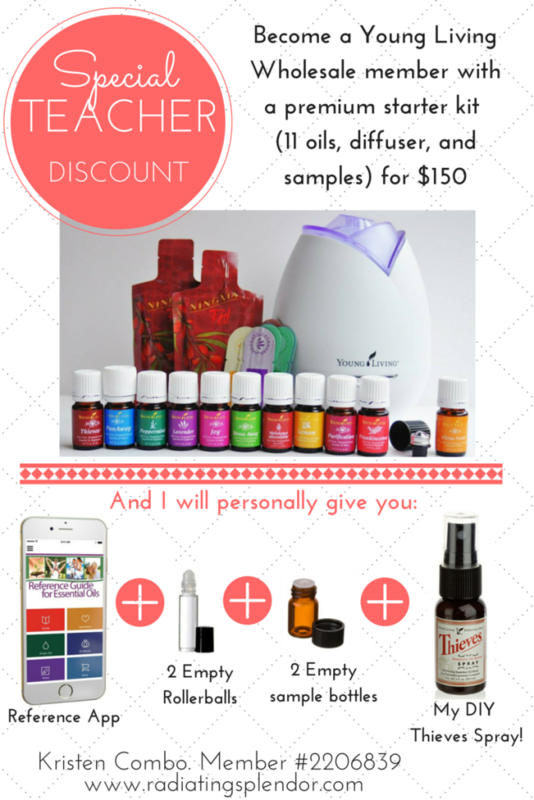 I am a teacher in Pflugerville (just north of Austin), and I am very excited to get started with essential oils. I will be following you here to lean more about it all. I’m excited for you to learn more too Tania! I can’t wait to begin this journey with you!